Where are you located, and who is/are your state representative(s)? My state representatives are Richard Burr and Thom Tillis. What personal experiences have shaped your decision to take action? Like most Americans, I have witnessed and been subject to costly care. I have close family members with chronic illnesses who have delayed care for years as well as insured family members who still have issues affording costly medication and pharmaceuticals. At times, my parents have even been forced to choose my care over their own. I came of age during the passage of the Affordable Care Act and entered medical school well after the beneficial effects of the reform were manifested in the American public. Nevertheless, the shortcomings of the ACA and the impending elimination of subsidies and benefits that help provide access to care for so many has further solidified my desire to move forward and fight for comprehensive care for all. How has your involvement in SNaHP encouraged others to join this struggle or to take a closer look at a single-payer healthcare system? Certainly. Although our chapter is in the embryonic stage of development–the Duke SNaHP chapter will be North Carolina’s first–classmates have been very receptive to our movement and vision for establishing a student organization that believes in the movement for single-payer healthcare. Do you see the right to healthcare as a single issue or one that is linked with other human rights efforts? The right to live a healthy life with access to quality care is undoubtedly tied to other facets of the movement for human rights. When people have to delay care and watch helplessly as their symptoms worsen or choose which vital medication to forego for the month or remain employed at a job they don’t enjoy just for healthcare, this impacts all parts of their lives and the lives of those around them. Healthcare should not be economically stratified. And I believe the right to healthcare is a layered issue that we must confront in many different spaces (i.e., health disparities in communities of color, reproductive rights, queer health services, environmental and residential racism, and beyond). Do you believe that universal healthcare will be achieved during your lifetime? I hope so! And I really believe in the activist spirit of my generational peers to make this happen. It’s certainly a long road ahead but I believe the tide is turning in our favor. What are some things in your city or state that you can do to make universal healthcare a reality? Grassroots and interpersonal organizing is critical. Speaking to people in your community about the feasibility of single-payer healthcare is also important. But there’s a myriad of tangible opportunities to support universal healthcare, such as calling your representatives and supporting other progressive organizations in your backyard who share a similar goal. What has been one of your most gratifying experiences as an advocate for single payer? Give an example of a response you have received from your colleagues in healthcare when you have identified yourself as an advocate for single payer. The Moral March in Raleigh was beautiful! 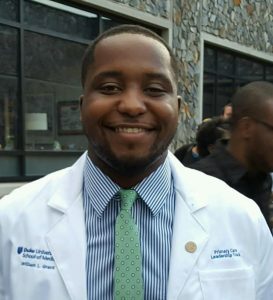 I was there with other medical students and healthcare professions students advocating for universal healthcare and other social justice causes. In addition, we were advocating alongside other progressive organizations and it was awesome to see the intersections of our respective causes. Generally, classmates are really receptive and want to know more! A close friend who was on the fence about single-payer healthcare and is also a medical student even seemed convinced following our small, personal discussion! It’s the small victories that matter. What is one thing you want to share with your medical student colleagues who are not SNaHP members? Get involved in the fight for universal healthcare and use your platform to advocate for your future patients. Single payer is not an ideological purity test or a hypothetical idea, but a necessity and a very real possibility for this country.